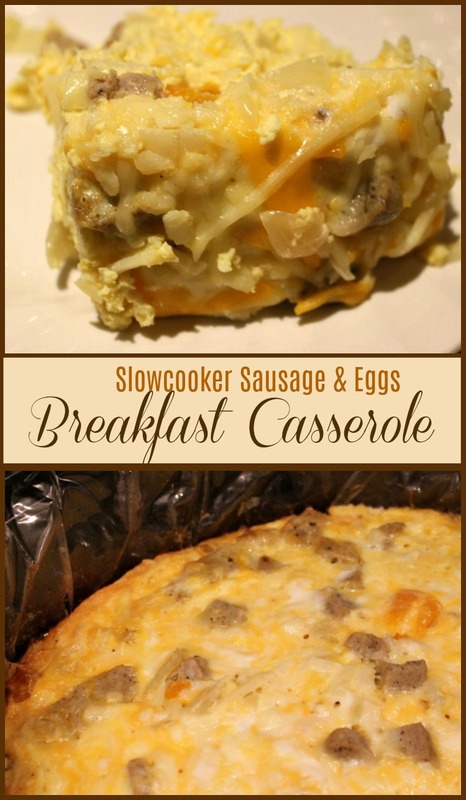 Slow cooker Breakfast and Eggs Casserole is great for a crowd. And if you don’t have a crowd, the leftovers for lunch the next day are great, too! I like to have casseroles for breakfast when we have guests. Usually we have some kind of activity planned and hearty breakfast keeps us going till lunch. This easy to make casserole fills the bill nicely. It is high in protein at 23 grams per serving for active people and just high enough in carbs at 18 grams to stick to the ribs. The eggs, well whisked, help keep this dish light. I use turkey sausage, but you can use your choice of sausage or even diced ham if you prefer. Precooked sausage crumbles speeds up preparation. In a time pinch, use frozen diced onions. The bell peppers add nutrition and color. Use any color. I had orange on hand. If you are buying just for this casserole, grab the green or red for more contrast. I like the frozen shredded hash browns for the potatoes because they “blend” in with the other ingredients, but you could use the small dice like Potatoes O’brien if your family likes definite potato texture. I wasn’t sure a slowcooker liner would work with a dish like this. Just once scrubbing the insert, convinced me to give it a try! It really worked well. You can serve by cutting and removing slices to plate for individuals or to put on a platter to serve family style. Or you can stick a big spoon in the crockpot and let people help themselves. The liner doesn’t seem to get in the way and doesn’t tear as easily as I feared it might. Make the casserole ahead of time and let it set in the fridge until bedtime. Last one to bed can take the insert out of the fridge and start it cooking, then set it to stay on the warm setting when done. Usually the night owls at our house are up long enough that it isn’t on warm very long before the early birds rise. 🙂 I’ve also made this for a brinner – breakfast for dinner. It only takes six hours to cook so it works well to mix this about lunch time, pop it in the crockpot and it will be waiting when you come back from whatever spontaneous activity you choose in the afternoon. Serve with yogurt and/or fruit for breakfast or with a salad and veggie for dinner. Note that this recipe can also be a Make Ahead Freezer Meal. Cheesy Sausage, Eggs and Potato Casserole cooked in the slow cooker for a hearty stick to the ribs breakfast that will keep you going. High in protein and low carb! Line slow cooker with cooking bag and spray with cooking spray. Place sausage in a large skillet and cook over medium-high heat, stirring occasionally, until browned, about 10 minutes. Chop onion, dice red bell pepper and mince garlic. Place in large bowl. Add sausage, potatoes and 1 ½ cups shredded cheese. Stir until mixed. Spoon evenly in crock pot. Whisk eggs, milk, salt, and pepper together in a bowl; pour over ingredients in slow cooker. Cook on low,for 6 hours, until eggs are set in the middle and the edges are beginning to turn brown. Sprinkle ½ cup shredded cheese over top of casserole and let set covered for about 10 minutes before serving. Mix sausage, onion, bell pepper, seasoning, potatoes and 1½ cup cheese in a gallon zipper bag. Place additional ½ cup shredded cheese in zipper sandwich bag to use for topping and add to gallon bag. Thaw this bag overnight before cooking. Whisk eggs and milk in large bowl and place in gallon zipper bag that is securely closed. Place entire bag in second bag and make sure it is securely closed (to avoid cleaning freezer if there is a leak) Thaw overnight before cooking. Whisk eggs and milk together when you are ready to cook the casserole. Place thawed package of sausage, vegetables and cheese in bottom of slowcooker. Pour the egg mixture evenly over the mixture. Cover and cook on low for 6 hours. Sprinkle half cup reserved shredded cheese over the cooked casserole, cover and let set for about 10 minutes until cheese is melted. Such a great idea to have the last one to bed start the cooking for the first ones to rise! Talk about team work! This recipe sounds so delicious. I’ve never cooked something like this in a slow cooker, I’m going to have to give it a try the next time we have guests over. This looks good but I do not have a slow cooker. Is there any other way to make this not in a slow cooker??? Thanks so much for stopping by and for commenting on my post about Blogging. I understand how things can happen in our personal life that leaves us without the time to do thing we want to. I am going to post when I can and not put all that stress on myself like I was doing….. Yes, you can bake it in the oven. Let me do a little looking and I’ll add the instructions for doing that. Yes to less stress!